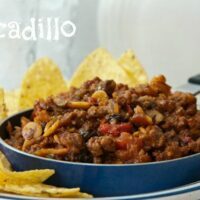 Four-Layer Meat and Potatoes in a Skillet is my go-to recipe for a busy day when I don’t want to go to the grocery store but the pantry is almost empty. Too exhausted to cook. Too tired to go out. You’re hungry, bordering on hangry. We first came to love 4-Layer Meat and Potatoes in a Skillet when camping. I know just about anything tastes better when you eat it in the woods, but whenever I’m in the mood for meatloaf and potatoes, this is a great substitute that takes much less time to prepare. Bacon! Like I said in my recipe for Bacon-Wrapped Jalapeño Chicken Bites, bacon makes any food fly off the table. 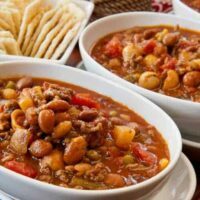 I’m not trying to sell this particular recipe as some amazing gourmet delight that will make your dress fly up, your pants fall down or your life turn out perfectly. Nope. 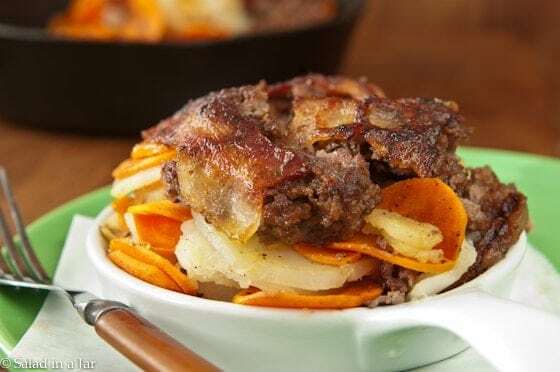 4-Layer Meat and Potatoes in a Skillet is a kind of comfort food assembled with four ingredients you probably already have on hand. Hopefully, you won’t have to make a special trip to the grocery store. Such a trip just before dinner is an exercise in patience I try to avoid. The only tricky part of this recipe is figuring out exactly where to set the heat so the bacon turns out crispy but not burned. If the bacon is still limp and light colored when the vegetables are soft, turn up the heat a bit. The correct setting will be affected by the type of pan you use and your particular stove. I can only suggest you experiment and stay close to the stove the first time or two you make this. Start with the bacon, second: ground meat, third: sliced potatoes, and finish with carrots. If you like ketchup with meatloaf, I highly recommend you serve this with ketchup, also. 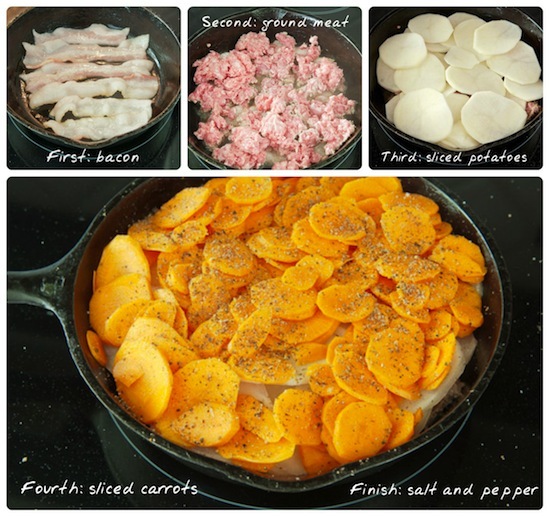 Cut bacon in half crosswise and place in a single layer covering the bottom of a large skillet. Crumble raw ground beef evenly over the bacon. Season with salt and pepper and cover. Cook about 15 minutes on medium to medium-low until bacon is crisp and vegetables are tender. Carefully drain excess grease before serving. The only tricky part of this recipe is figuring out exactly where to set the heat so the bacon turns out crispy but not burned. If the bacon is still limp and light colored when the vegetables are soft, turn up the heat a bit. 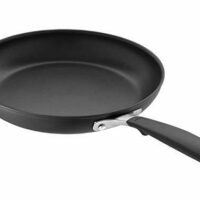 The correct setting will be affected by the type of pan you use and your particular stove. I can only suggest you experiment and stay close to the stove the first time or two you make this. 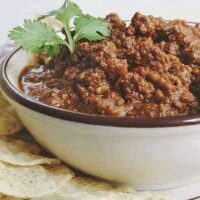 A classic chili with chocolate added. You can't taste it but it mysteriously adds depth and smoothness to the flavor. This looks yammy. I also make similar to this what I found on Russian website. In cold skillet put a layer of half portion of ground meet (or any meat combinations: beef and pork, beef and chicken, etc), salt and pepper. Then layer of thinly sliced potatoes, salt pepper. Then thinly sliced onion, salt and pepper. Repeat same layers with second half of meat, potatoes, onion, salt and pepper. Put on a top mayo and shredded cheese, cover with lid. Cook 20-25 min on low-med heat until you see steam coming out from underneath of lid. Put aside, let it rest 10 min. My husband and son love this dish. For reason not understandable to me Russians call it French Potato Pie. Interesting variation. I must give it a try. Ohhhh! Yum. AT the end of the day, I need some winning no-brainers, thank you! My husband is not the biggest cooked carrot fan…does anyone have a substitution suggestion? Update-had this again Wed. night and it was really yummy. My DH ate all the leftovers for lunches and said it reminded him of camping with his family when he was a little guy. He is a total fan of this dish! Your pictures are great. I do have a question — It appears that you did this yummy 4-layer meat & potatoes in an iron skillet. It also looks like you have a glass top stove. I had been told iron skillets were a no-no with ceramic or glass top stoves, so do I dare try this with my Granny’s iron skillet? Can’t wait to taste it! I have never heard that about glass top stoves and iron skillets. You could be right for all I know. But I use them with no problem I am aware of. HOWEVER, I normally prefer to use non-stick skillets because I don’t like to wash things by hand. The skillet in the picture is only a prop but you could certainly make this in an iron skillet. Again, I, myself, make this in a non-stick skillet for ease of clean-up. Thanks for your quick reply. I plan to try the recipe this week and will likely use the non-stick skillet, but I might try it sometime in the iron skillet in the oven. Blessings to you today! OK-made this last night and DH said Yum! We named it Campfire Skillet. I did saute 1/2 onion until soft and spread on the beef and my stove must have come over on the Mayflower bcuz it took 45 minutes to get done. DH is a gravy freak so a small batch of brown gravy was served on his. We both brought it today for lunch. Highly recommended. Do the potatoes really cook in 15 minutes? How’s it going? Yes, the potatoes will cook in 15 minutes. Slice them very thin and of course, the skillet it is covered as it cooks so it doesn’t take long. Wow! This recipe looks really good (and easy!). I don’t think I would have ever thought to put everything in the skillet at once. Brilliant! I will definitely be giving it a try in the near future. Thanks for sharing! Wow, this must be loaded with flavor, I love that the bottom becomes the top with that yummy bacon! The picture definitely looks better than anything we ever produced camping!!! Looks delicious especially with the crisp bacon to top! Yum! This is definitely a mans meal for sure, my husband would love this, I’ll have to give it a try for him! Looks delish, Paula, and really takes me back a few decades. My Mother used to make something like this quite frequently. We add sliced onions and sometimes bell pepper to what you use. If it’s on hand, we throw in a little sliced green cabbage. Also, a little leftover cooked brown rice is in the bottom of the Dutch Oven. Everything is layered with a sprinkling of S&P, then a 28oz can of tomatoes is poured over the top. Put lid on and cook about 30 minutes. We never tried bacon… good idea. 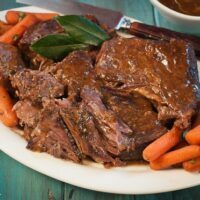 Now-a-days we layer and put it all in a crockpot and let it cook itself all day. Yum; -). Thanks for a great post. You know what I love? There’s a good amount of veggies here! I know you get it, but I am often in disbelief how many one pot recipes lack enough veggies. Looks great! Thanks for sharing! This should be a very popular recipe on your blog, for sure, Paula. Heinz now makes a ketchup with balsamic vinegar which I use on meatloaf. The leading photo is gorgeous. Thanks for the heads-up about the catsup Gary. I think I must pick some up ASAP. 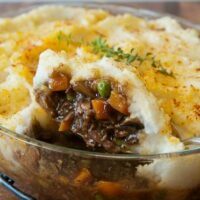 I make a version of this in a casserole — my husband’s all-time favorite dish! I put the sliced carrots, potatoes, layer of onion, salt & pepper (lightly.) 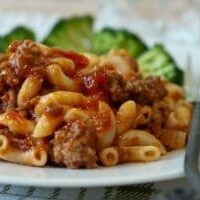 Then add a layer of ground beef ( I usually brown it,) salt & pepper, pour over a can of tomato soup, diluted with half can of water. Cover with foil, bake 350 1 hr. — so good! Oh Sally, That sounds wonderful! Must try when I have an hour for it to bake. Oh, my, Paula! It doesn’t get any easier than that! We all have days that fill up too fast, leaving less time to cook dinner. Thank you! One question: You do not cover the skillet with aluminum foil to hold the heat in to help the potatoes and carrots cook? Maybe I’m overthinking this one! It’s too easy! Yes, yes. You must cover it to hold the heat in. I use a lid but aluminum foil would also work.